Diabetic retinopathy is a complication of diabetes that affects the eyes and is caused by damage to the blood vessels in the retina. This is the most common diabetic eye disease and is the main cause of blindness in American adults. Retinopathy is caused by the blood vessels of the retina swelling up and leaking fluid, which is caused, in turn, by the high levels of blood sugar damaging or even blocking the tiny blood vessels. High blood sugar over a long time can cause the lens to swell up, which is another potential cause of blurred vision. Most often both eyes are affected. Initially, diabetic retinopathy has no symptoms, but over time it can cause vision loss. Other potential symptoms include seeing floaters, blurred vision, fluctuating vision, dark or empty areas of vision, and difficulty with color perception. Advanced retinopathy can lead to blindness. Mild Nonproliferative Retinopathy is the initial stage. At this point there are microaneurysms, which are tiny areas of swelling in the retina’s blood vessels. Moderate Nonproliferative Retinopathy is characterized by blockage of the retina’s blood vessels. Severe Nonproliferative Retinopathy results when even more blood vessels are blocked and cause areas of the retina to become deprived. The final stage, Proliferative Retinopathy, is caused by the retina becoming deprived and the body building new blood vessels. These new vessels are very fragile and abnormal and can leak blood causing severe vision loss or even blindness. Additionally, scar tissue due to the formation of these blood vessels can cause the retina to detach, or the fluid can build up leading to glaucoma. Another way that diabetic retinopathy can cause vision loss is through macular edema. Fluid can leak into the macula, which causes it to swell and vision to blur. This can occur at any time, although it is more common in the Proliferative Retinopathy stage. 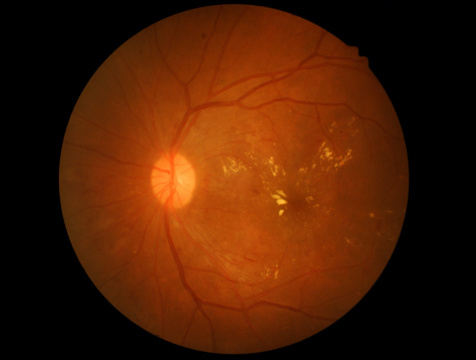 Both type 1 and type 2 diabetes are risk factors for developing diabetic retinopathy. People with diabetes, particularly pregnant women, should have regular eye exams to check for signs of retinopathy. To prevent diabetic retinopathy blood sugar should be carefully monitored and kept as close to normal as possible. About 40-45% of diabetics develop diabetic retinopathy, but controlling blood sugar can greatly slow the onset and progression of the disease. Regular eye exams leading to prompt treatment can reduce the risk of blindness by 95%.